Swinging thru. How's life treating you? do miss ya, ya know. That's alright. Take as much time as you need. Also, I wouldn't mind if you needed the full (original) render. 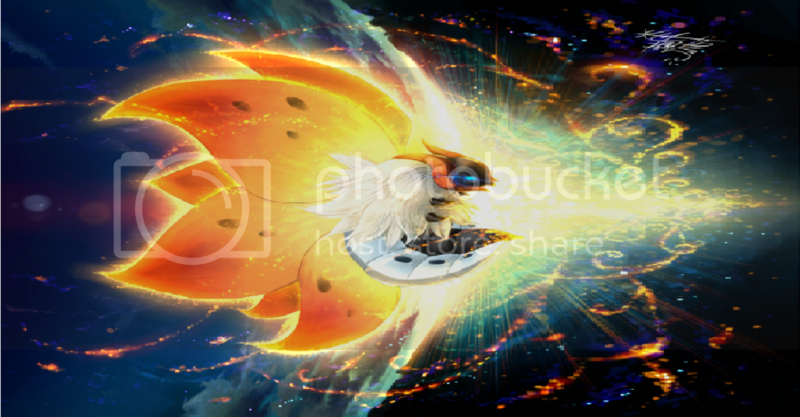 The angle of the Volcarona isn't that bad, after all. If you can, I would like to at least keep as much of the wings as possible. I would like it to be pretty much have a fiery theme mostly based off the wings. What do you think of this? I found the render, but it wasn't at all suited for a sigpic, so I made a lot of adjustments to its size and orientation. I know the picture is quite large, but I figured the bigger, the easier it would be to work on. Mind over matter. Mind under matter? It doesn't matter. Never mind. F1, books, GFX, music, interwebz, my own lolcats.